The way Matt Harvey’s tempestuous tenure with the New York Mets ended last May is still an eye-rubber. When Harvey refused a Mets’ request to go to Las Vegas and work his way back to something resembling his former mound self, prompting the Mets to trade him to the Cincinnati Reds. When the Mets decided he wasn’t worth saving anymore, and nobody on or around the Mets seemed to care. A week earlier, in San Diego, Harvey managed somehow to make a tony Beverly Hills restaurant opening. Microcosmically that was Harvey’s dilemna as a Met. As former Met Jesse Hahn, his high school teammate, once said, he had no relationship with Harvey “because he’s always big-timed me.” The Dark Knight proved only to self-immolate himself in the brightest lights he could find and, when his health began to erode the talent that was once just as electric, he may have tried too hard to keep the illusion because he lost his own plot. But once he got out of New York and into Cincinnati he seemed a changed young man and pitcher. For the first time in what seemed an excessive sentence, Harvey was healthy. He never missed a single starting assignment as a Red. And as he approached free agency, the only Red headed that way in 2018, he showed enough to convince the Los Angeles Angels that his potential upside, very different from the incendiary young Met, was worth gambling $11 million for a single season. Are the Angels tempting too many fates? Anaheim is closer to Hollywood and Beverly Hills than San Diego, even if Harvey in Cincinnati seemed a changed young man without the lure of the demimonde. But tempting the fates has always been in the Angels’ DNA, even when they were successful. And far bigger deals than Harvey’s have incinerated them in the recent past, though the flames weren’t always of their own making. It was nobody’s fault including Albert Pujols’s when serious heel and knee issues began reducing the future Hall of Famer—whom the Angels signed for a decade and the value of a large state economy—to little more than a designated hitter who can still hit for distance (he hit home run numbers 500 and 600 in Angel fatigues) but can barely stand up at first base anymore. Lacking the kind of teammates not named Mike Trout who can get on base ahead of him hasn’t done Pujols’s run production that many favours, either. A lot of people may still wonder how Pujols still managed to drive in 100+ runs in four of his seven Angel seasons. It was nobody’s fault that Josh Hamilton battled injuries as an Angel before relapsing into a brief spell of substance abuse on one otherwise fine Super Bowl Sunday. But what the Angels did to Hamilton upon that relapse was a disgrace. Hamilton himself reported the relapse to major league baseball, as vivid a cry for help again as you could ask. Angels owner Arte Moreno elected to run him out of town on the proverbial rail, though Moreno might have preferred a hypersonic airplane. And now-retired manager Mike Scioscia demanded he apologise. Then the Angels paid the Rangers to take him back, basically. The Angels were pitching strapped before they trained their sights on Harvey. They’ve lost Garrett Richards, J.C. Richards, and Rookie of the Year Shohei Ohtani (as a pitcher, not a designated hitter) for 2019 thanks to Tommy John surgery. They couldn’t convince J.A. Happ to sign for two years and $28 million; Happ’s returning to the New York Yankees. They couldn’t convince Patrick Corbin to stay in the southwest at a “strong” offer; Corbin, of course, signed for $140 million with the St. Louis Cardinals. With the American League West rival Oakland Athletics (who now claim Las Vegas as their AAA affiliate, the Mets having moved theirs to Syracuse) showing interest in the righthander, the Angels convinced Harvey to sign up for a year at comparative bargain money. They’re banking at minimum that Harvey will continue the improvement he showed in Cincinnati, where he began finding a little more velocity on his pitches after it eroded with the Mets (92.6 mph as a Met; 94.4 as a Red) and where he began missing bats again. As a Red, Harvey pitched 128 innings. His ERA didn’t look anything like his Dark Knight years at 4.50, but he had more quality starts than not—his 24 starts included fifteen quality starts (five or more innings, three or less earned runs) including his final gig of the season. He had seven no-decisions in those quality starts and five of them the Reds went on to lose by a single run. Maybe his biggest was nearly no-hitting the Giants against Madison Bumgarner in August, taking the hitless bit to the sixth and the Reds winning the game 7-1. His swinging strikeout rate jumped from 8.2 with the Mets earlier in the season to 9.9. 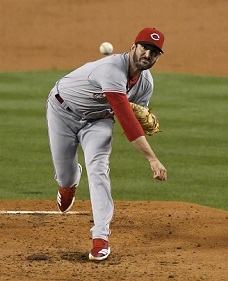 He returned to a 7.9 strikeouts-per-nine rate as a Red with a 42.6 percent ground ball rate. And his fielding-independent pitching was enough points lower than his ERA to suggest Harvey, too, could hardly do more to neutralise the Reds’ overall futility. It wasn’t his fault the Reds couldn’t really afford to keep him aboard even at the two years for which he looked and scouts figured he might receive. As a Met, Harvey’s early promise got flattened first by Tommy John surgery and a return season in which his workload was questioned severely. Earning Comeback Player of the Year honours for 2015, Harvey crowned that season famously by all but demanding the ball to go back out for the ninth of Game Five of the World Series. Then-Mets manager Terry Collins read his man’s heart deeper than the fuel tank even with a 2-0 shutout in the making. Harvey ran empty with a leadoff walk and, after a stolen base, an RBI double to break the shutout. The Mets’ porous defense allowed the Royals to blow a sure save for now-prodigal reliever Jeurys Familia, when Lucas Duda threw home wild on a sure double play, and the bullpen held fort before a spent Addison Reed got murdered in the twelfth for the Series. Then it was thoracic outlet syndrome surgery to kill Harvey’s 2016 in its crib. (The syndrome is cause when blood vessels and/or nerves between your collarbone and your first rib compress, causing shoulder and neck pain and finger numbness.) Then, a 2017 interrupted rudely by a shoulder injury. Concurrently, Harvey melted down. The demimonde among whom he felt most at home when not rooting for the New York Rangers of the NHL no longer comforted him. And the aforementioned big-timing attitude left him wanting for empathy when his mound trouble matched his off-field heartbreak. The Angels saw a haunted pitcher finding smarter ways to pitch with the numbers trending upward little by little in Cincinnati after he’d collapsed so completely in New York. They’re investing in a realistic enough chance that Harvey approaching 30 years old can continue the upward trend enough to give them one less rotation piece over which to fret. If he does continue upward and stays healthy he becomes a bargain of a middle-rotation piece. Harvey seemed too often at core as though the big-timing attitude seen in him was really a clumsy way of letting the world know that it wasn’t his teammates who weren’t worthy of him but the other way around. If he learned anything else in Cincinnati other than beginning to remake himself as a major league pitcher, he may have learned that one of the loneliest places on earth is the place to which you fall, good and hard, discovering no empathy, after you’ve burned yourself too deeply seeking artificial life. For Harvey the Angels are his chance to pitch himself into either an extension with the Angels or a decent payday after the 2019 season ends. So far, all he has to do is remember that, as close as they are to Angel Stadium, the Los Angeles/Hollywood demimonde is only smaller, not less psychically incendiary than it is in New York. It will be interesting to see which Matt Harvey the Angels get. One point in Harvey's favour is that the Angels pay very close attention to their pitching. By the way, an edited version of my essay "The 1919 Reds, rehabilitated: They wuz robbed" was just published in Black Sox Scandal, a newsletter of the Society for American Baseball Research. Thank you! Anyone who wants a copy, message me privately.